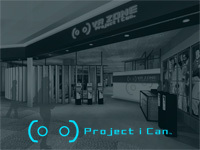 Bandai Namco opens a virtual reality experience area in Odaiba (3rd Floor DiverCity Tokyo Plaza) today: VR Zone Project i Can. It will be opened until October, 10. This is a 5870 square-foot and is a virtual reality research facility where Bandai Namco will test different VR experience to get users feedback. If this experience is a success, they might pursue development in virtual reality and maybe putting VR corners in amusement stores... 9 VR experiences are already playable: Doraemon VR Anywhere Door (leap from Nobitaâ€™s room into a completely different world), Gundam VR Daiba Assault (experience the impact of the life-sized mobile suit in battle), VR-AT Simulator Armored Trooper Votoms Battling Dudes (experience a real one-on-one battle), Super Star Stage Simulator Max Voltage (experience the euphoria of being on stage), Steep Downhill Ski Simulator Ski Rodeo (ski down the sharp slopes of the vast snowy mountain), Extreme Courage Test Machine Fear of Heights: The Show (test your courage at 200 meters above the ground), Immersive Horror Room Hospital Escape Omega (escape from this cursed abandoned hospital), VR Train Control Room Train Meister (experience the real driving sensation on the JR Yamanote Line), Interactive Cinematic VR Attraction Argyle Shift (enter the cockpit of a giant robot with your android). Visitors pay with a Bana Passport (300Yen) and the price varies from 700Yen to 1000Yen according to the game and the time. Average time is 7 minutes. Children under 13, pregnant women and ill people cannot enter the VR Zone. A second VR Zone will be opened in Shinjuku this Summer. 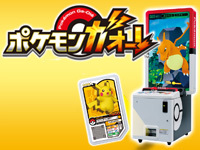 Takara Tomy Arts and Marvelous announced a children's arcade game named Pokémon Ga-Olé. The game uses a special type of card designed for children named "Olé disk". They are more thicker than normal game cards. Kids insert them in a card reader and a 1vs1 Pokémon battle starts. 50 Olé disks will be available at the start. The game cabinet features a 50" screen. Pokémon Ga-Olé should be out in July 2016. Update: The name of the game is Dragon's Heaven. 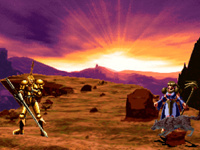 It was developed at Face by ex-Technos staff members (part of the development was outsourced to Toy Pops), the game release was planned for the end of 1997. 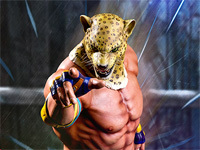 It was to be a story driven fighting game with a lot of text between fights. 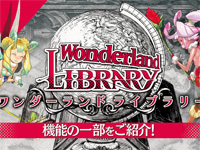 The story was written by Kengo Asai. You'll find a good sum up of all info at MadMan's Cafe. 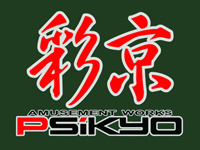 This month you will find a superb forest green coloured Psikyo T-shirt at 1cc Shirts. Psikyo's story begins in 1992 at Video System. After the release of Aero Fighters (Sonic Wings in Japan), the designer of the game Shin Nakamura leaves the company to found Psikyo and continues to develop shooting games including the famous Sengoku Ace, Strikers 1945, Gunbird and Zero Gunner series. Psikyo is also responsible for the well-known Taisen Hot Gimmick series of mahjong games. Psikyo also released two fighting games: Battle K-Road (which offers realistic fighting moves) in 1994 and The Fallen Angels (developed by The Steel Hearts) in 1998. A part of the team behind Fallen Angels went to SNK to work on The King of Fighters '99. After releasing a mahjong game with G-Taste characters in 2002, the company was acquired by X-Nauts. Their last arcade game, Taisen Hot Gimmick 5, was released in 2005. Psikyo productions have marked the '90s with their sumptuous graphics, perfect gameplay and very high difficulty. You have until Sunday, April 24 to order this Psikyo T-shirt. It will not be available any more after that date and will never be reprinted. 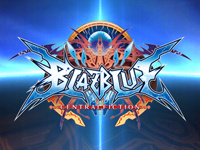 A new update of BlazBlue CentralFiction is available in Japan since today. 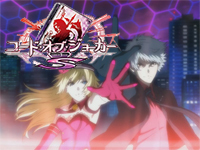 The story of CentralFiction continues in BlazBlue CentralFiction Act3. A new mode named Alliance Mode is added: the player creates a team of 4 characters with different parameters and can get new ones from enemy teams. The trailer is available here and the opening here. KONAMI starts operation of 2 BEMANI games today! 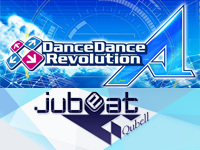 DanceDanceRevolution A and jubeat Qubell. DanceDanceRevolution A features a lot of new EDM (Electronic Dance Music) songs and remixes. The selection screen has been redesigned and the game is easier to play. Konami confirms that there will be location tests of DanceDanceRevolution A in some Dave & Buster (USA) this summer. jubeat Qubell is the second game released today. There are 30 new songs for a total of 600 songs. A new system analyzes player's choices and automatically suggests songs popular among players sharing the same taste. 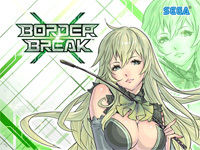 During a conference held today at its headquarters, Sega announced a new Border Break game. Border Break X is scheduled to be released in early Summer 2016. There isn't a lot of information about this new version but the main color will be green and there will be a new type of weapons to respond to any war situation: guerilla weapons.